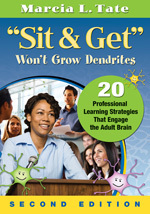 Tate, Marcia L. (2012) “Sit& Get” Won’t Grow Dendrites (2nd edition). California:Corwin. The richness of a book like “Sit & Get” resides in the fact that not only can it be used as an extremely useful source of ideas to apply in the adult classroom, but it can also be an invaluable resource for researchers who would like to be up to date on the latest research regarding the various strategies presented in this edition. Starting with a theoretical framework on adult learning, Tate moves on to present twenty strategies that could be easily applied in any classroom across higher education. Tate’s vast experience in adult learning and her creativity are clearly shown in the presentation of each strategy. Starting with a definition of the strategy, Tate moves on by presenting an updated and revised theoretical framework that provides a solid base supporting the use of the strategy. In each case, Tate’s careful selection of examples offers a variety of options to the reader. The ‘how to’ section that appears with each strategy offers a multiplicity of potential applications. At the end of each strategy’s presentation, Tate offers an actual space for reflection notes on the material presented. In this manner, the book becomes almost a reflective journal that may be modified with time. From brainstorming and discussion, to mind maps, humor and the use of drama in the classroom, Tate walks us through a variety of options and for each, she makes suggestions, gives options and offers a wide variety of applicable recommendations that professionals may adapt or adopt according to their audience. Compared to other resources available, I found this book extremely engaging and thought provoking. Tate goes directly to the point and reading this book is an agile and thought provoking experience. “Sit & Get” is well organized, clear and extremely adaptable to many levels. 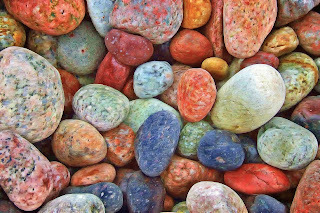 Educational developers, as well and instructors, would benefit immensely from this resource. The book is an easy read and as the reader moves through the many sections, the examples offered by Tate may trigger an immediate response of possible applications of the concepts, or what is even better, it creates opportunities for new ideas. I found this resource extremely dynamic and helpful to make a classroom experience better.